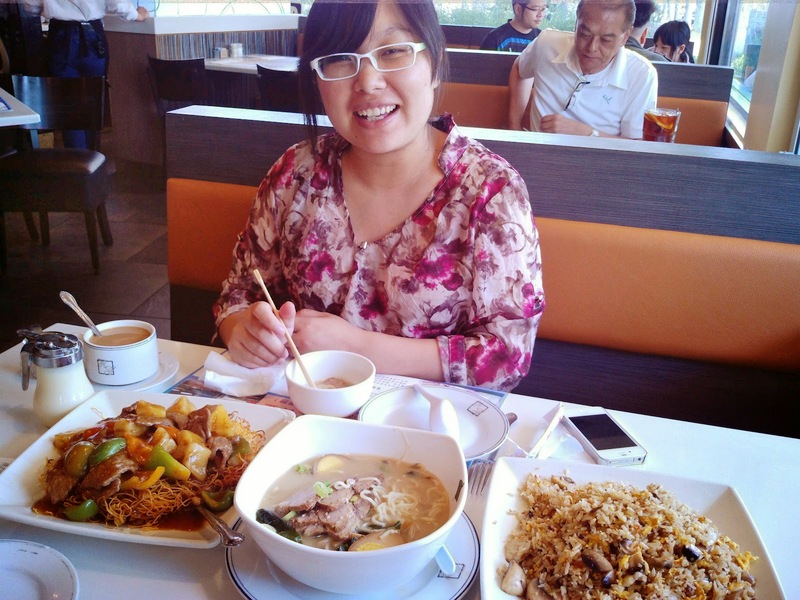 Here's Miss Yangmei from Beijing, China, enjoying some Hong Kong style cafe food. One of the first things that Yangmei cooked for us was Chinese dumplings. I had made them before myself but when I tasted hers, I found that hers were more moist and juicy and somehow tasted more flavorful. She used just a few ingredients while mine had more ingredients. However, she shared with me one very distinct difference -- she adds quite a bit of hot oil (about a cup) to the meat before wrapping. I was quite taken aback at first by the sheer amount of oil that was added but after tasting the dumplings, I could see why. She said that the oil acts as a binder but also brings out the flavor of the ingredients due to the heat. For this recipe, we made two slight variations of pork dumplings. One had chopped Chinese long beans, while the other contained chopped Chinese chives. While both were good, I preferred the chives version. Pork and chives pair really well together as dumpling filling! Chop the Chinese long beans into small pieces. Wash the Chinese chives and also chop them into small pieces. 2. Add the minced ginger, minced garlic, five spice powder, salt and soy sauce to the ground pork. 3. In a small pot, heat the oil until smoking point. 4. Remove the oil from the heat and immediately pour it over the ground meat mixture. With chopsticks, stir the meat mixture until the oil is well incorporated. 5. Add half of the meat mixture to the chopped Chinese chives and the other half to the chopped Chinese long beans. 6. Voila! Two kinds of pork dumplings! 7. Set the dumpling wrappers on a board or large plate with a bit of flour. This is for dusting the dumplings before setting them on a plate so that they don't stick together. 8. Place the wrapper in one hand and add one small spoonful of filling to it. 9. Seal the edges firmly. If the wrappers are not sealing properly, add a dab of water to the edges before sealing. You can also seal the dumplings in a variety of ways. Get creative! Here, Yangmei seals the edges then bends them into a half moon shape. You can also pleat the dumplings so that they look fancier. Fold the top edge of the wrapper into pleats and press it firmly onto the bottom edge as you go along. 10. Steam the dumplings in a bamboo or metal steamer for about 10 to 15 minutes. You can also fry or cook them in soup. Freshly steamed dumplings ready to be served with ponzu sauce or with black vinegar and ginger. These dumplings can be stored in the freezer for several months. 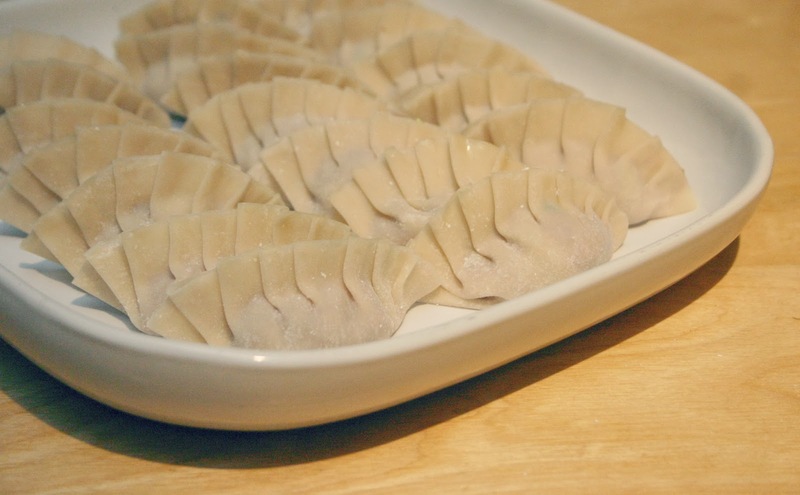 To freeze, put the dumplings on a plate in a single layer and place in the freezer for 1 hour. Transfer them from the plate to a plastic storage bag and return to the freezer. Now you can have delicious dumplings whenever you want!